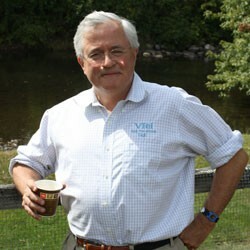 VTel’s Michel Guité promises to bring universal broadband access to rural Vermont. Can he deliver? Vermont Technical College was a fitting location for a tech-focused town-hall-style meeting convened by Sen. Bernie Sanders late last month. The discussion centered on the future of high-speed Internet access, aka “broadband,” for the 84 Vermont communities — or one in five Vermont households — that don’t have it yet. It would be an overstatement to call the crowd of roughly 200 Vermonters an angry mob. But many came to voice their displeasure with the federal government’s decision to award the largest slice of Vermont’s economic-stimulus pie destined for broadband — $117 million — to Springfield-based Vermont Telephone Company, or VTel. The target of their contempt: VTel’s owner and president, J. Michel Guité. The largest and most vocal contingent? Loyal fans of East Central Vermont Community Fiber Network, or ECFiber, who were easily identifiable by their matching T-shirts. ECFiber, a partnership of 22 municipalities, also applied for stimulus money, with a proposal to run fiber-optic lines to every home and business in its service area. The USDA’s Rural Utilities Service (RUS) denied its application. Some of the audience’s resentment stemmed from the fact that the money was awarded to a privately held corporation rather than to ECFiber, a publicly owned entity based on the Burlington Telecom model. In fact, ECFiber is led by former BT general manager Tim Nulty. Other attendees challenged the viability of Guité’s proposal. He plans to deliver high-speed Internet service to hard-to-reach areas using a combination of fiber — indisputably the industry gold standard for broadband delivery — and a new, cutting-edge technology called 4G LTE, or fourth-generation “long-term-evolution” wireless. To rural Vermonters who’ve been frustrated by years of unfulfilled promises of high-speed Internet connecting their homes and businesses, the mere mention of “wireless” likely conjured up images of Internet dead zones, weather interruptions, glacially slow connections and dropped cellphone calls. For those who’ve waited a long time to travel the information superhighway, it seemed as though Guité was offering them a ride in an Edsel. “I’m concerned that we’re essentially buying 8-track tapes for the entire state,” said John Fagan of Bethel. Dr. Carol Boerner, an ophthalmic microsurgeon from Reading, explained that she needs to be able to stream 3-D video at home for her continuing education classes. “Wireless is of no use to me,” she complained. Their scorn was shared by self-described experts in the field. “This system will be obsolete the day it’s built because the demand for broadband is doubling every five years,” asserted Jack Bryar, a former telecom editor for Thomson Reuters news agency. But Jonathan Adelstein, the former FCC commissioner who runs RUS, which awarded the stimulus grants, tried to assuage such fears. 4G wireless is “a real game changer” for Vermont, he asserted, “the most robust technology out there, bar none. It was Guité who was on the hot seat, doing his best to remain upbeat and diplomatic. As expected, Sanders held Guité’s feet to the fire and put him on the record as promising to deliver “affordable, universal broadband access” to “every unserved community in Vermont within three years.” Starting price: $10 per month. Guité had no sooner agreed to the terms than he started qualifying the complexities of providing high-speed Internet to every nook and cranny of the state. Indeed. Even after a two-hour grilling, questions remained: Who is Guité, and what’s his track record at VTel? Can Vermonters trust him with nearly $117 million in taxpayer dollars? And can his small rural carrier, with just 20,000 phone lines in Greater Springfield, deliver on such a bold statewide promise when larger companies have failed to do so? In short, will VTel become Vermont’s next FairPoint fiasco — or the success story that finally brings all of rural Vermont into the digital age? The VTel headquarters is a flat, white, one-story building sandwiched between Route 106 and the Black River in downtown Springfield. It could easily be mistaken for a community bank or a garden center. Inside, it’s a serene, open-air work space with a cheery receptionist who answers the phone on the first ring. Beside her desk is an antique wooden barrel filled with local apples free for the taking. I’m quickly greeted by Guité, a small, round man with short gray hair who speaks almost in a whisper. He’s sporting khakis, brown moccasins and a rumpled, blue, button-down shirt with the VTel logo over one pocket. On his wrist is a plastic, multicolored watch that a child might wear. But Guité doesn’t have his own office or even a walled-off cubicle — just a modest desk in one corner of the room. It’s adorned with crayon drawings and photos of children of various ages I mistakenly assumed are his grandchildren. He clarifies that his five kids range in age from 6 to 27, and there’s a sixth on the way. Evidently, Guité sees himself as much younger and more vigorous than his 65 years suggest. Born in Montréal into a family of modest means, Guité was raised in English-speaking Nova Scotia. He put himself through college, while also supporting his mother and sister, by working as a bellhop for $135 a week at the Hôtel-Motel La Côte Surprise on Québec’s Gaspé Coast. In college — at Dalhousie University in Halifax — Guité wrote for the student newspaper, the Dalhousie Gazette of Nova Scotia, the oldest college newspaper in North America. Upon graduation, he got a job in Montréal as a financial reporter with the Canadian Press. One day in 1967, his editor announced that he was going to Israel to fight in what came to be known as the Six Day War. Guité was promoted to financial editor. Two years later, Guité came to the United States on a Ford Foundation grant to Stanford University. Later, he transferred to MIT, where he studied two-way interactive cable TV systems. However, since Guité was duty-bound by his Ford Foundation grant to complete his degree at Stanford, he returned to the West Coast and got a PhD working on early applications of microwave technologies. While still at MIT, Guité saw a flyer for a summer rental in Vermont. Eager to find a quiet place to complete his studies, Guité rented the place for $100 a month from Mrs. Richard Derby of Proctorsville. He soon discovered she was Ethel Carow Roosevelt Derby, Teddy Roosevelt’s daughter. The deal required Guité to do some minor upkeep on the house that included daily dismantling of a nearby beaver dam. Guité attributes his fondness for Vermont to his experiences during the two summers he rented from Derby. After Stanford, Guité went to work on Wall Street, where he got a job as a telecom industry analyst at Salomon Brothers in 1972. Twenty years later, he started looking to buy his first company. His partner at the time was businessman Walter Hewlett, whom he knew from his Stanford days. Together they put together a deal to buy a small, rural phone carrier in Vermont that was being sold off by GTE. On a shelf behind Guité’s desk is a nameplate that reads, “Walter Hewlett, music scholar” — an inside joke, he says. Hewlett, who studied music at Stanford and still teaches there, is the son of the late William R. Hewlett, cofounder of Hewlett-Packard. Walter Hewlett’s name may be familiar because he chairs the William and Flora Hewlett Foundation, a major underwriter of National Public Radio. But Wall Street investors know Hewlett better as the HP board member who, in 2002, led a contentious but unsuccessful proxy fight against then-CEO — and current U.S. Senate candidate — Carly Fiorina when she proposed a controversial merger with Compaq. At the time, VTel had only 17,500 lines and sold for $42 million. Initially, Hewlett and Guité tried to interest venture capitalists, but Wall Street investors wouldn’t bite. In fact, the VTel purchase was part of a much larger deal worth several hundred million dollars involving 18 properties in three states. Coincidentally, the entire deal was orchestrated by FairPoint in its pre-Vermont days. One of Guité’s first tasks, he says, was to renovate company headquarters, then a “concrete bunker.” More importantly, under his leadership — Hewlett’s interest in the company was largely bought out by the early 2000s — the company modernized rapidly. In 1994, VTel became the first telecom in Vermont to offer Internet service, smart payphones and fiber to the home. Today, VTel has more than 75 percent broadband penetration in its service area, one of the highest rates in the state. Guité primarily considers VTel a Vermont company — its 1400-mile fiber network runs to public schools in Burlington, Montpelier, Rutland, Springfield and White River Junction, among other places. But its reach extends well beyond Vermont’s borders. VTel also owns fiber networks running to Boston, Montréal and New York City. Its customers include major institutions such as MIT, Dartmouth College and McGill University. Recognizing that the future of telecom would require both fiber and mobile wireless technologies, about eight years ago Guité began buying up FCC wireless licenses around the state. David O’Brien, commissioner of the Vermont Department of Public Service, describes that decision as “visionary” on Guité’s part. Bob Flint, executive director of the Springfield Regional Development Corporation, describes Guité as a leader who “puts his money where his mouth is. Glenn Cordner agrees. The CEO of Springfield Hospital and Springfield Medical Care Systems, a network of nine community health centers in Windsor County, says that his medical centers are heavily reliant on high-speed broadband. Guité, he says, has been “an exceptional community citizen” who’s provided “totally consistent and excellent” service to his facilities. Most Vermonters — outside Springfield — had never heard of Michel Guité before VTel’s whopping $116.8 million federal stimulus grant was announced earlier this year. But he’d made news in early 2008 for trying to relocate the graves of a War of 1812 veteran and his two granddaughters on his 150-acre property in Hartland. As Guité told the Valley News at the time, the family plot was only 15 feet away from where he intended to build a house, and he feared the graves would disturb the “serenity” of the place. Such “persistence” hasn’t won Guité many friends in Vermont’s labor community, either. Mike Spillane, business manager of the International Brotherhood of Electrical Workers Local 2326, says his union walked away from VTel’s union employees because, as he puts it, Guité threatened to “put me in the poorhouse in court. Spillane also wonders how VTel would be able to handle a major power outage, such as the ice storm of 1998, with just 70 employees on staff. On occasion, Guité has gotten his wires crossed with state regulators. As the Valley News reported last month, in 1997 VTel got in trouble with DPS for using revenues generated by ratepayers for, among other things, artwork and leisure travel. That case resulted in a $750,000 refund to VTel customers. Nevertheless, O’Brien and others at DPS report that VTel has had an “excellent” consumer track record in recent years. Based on such indicators as customer-service complaints, outages and the speed of restored service, DPS spokesperson Steve Wark describes VTel as one of the best telecom companies in the state. But customer service is not a substitute for connectivity. Not everyone buys Guité’s assurances that VTel can provide fast, cheap and reliable broadband service to every farmhouse, henhouse and outhouse in the state. Is VTel’s plan for deploying a combination of fiber and 4G wireless technologies a workable solution for rural Vermont? Tim Nulty, ECFiber’s project director, doesn’t think so. In his recent editorial on the website Vtdigger.org — which failed to identify Nulty’s connection to ECFiber — Nulty described 4G LTE wireless service as “roughly equivalent to DSL” and “far inferior” to what fiber delivers. Not so, according to other telecom experts who don’t have an ax to grind. Tom Evslin, Vermont’s former “technology czar,” told Sanders recently that wiring Vermont with 100 percent fiber would cost about $1 billion — or one-seventh of the total stimulus money dedicated to expanding rural broadband in the entire country. Coppom disagrees with Nulty’s claim that 4G wireless won’t deliver video as promised. As he explains, video typically streams at a rate of between 3 megabits per second — say, for a mobile device — and 20 megabits per second for a large flat-screen TV. The latest tests of 4G done by Verizon Wireless delivered speeds of 50 to 60 megabits per second, Coppom says. Even if VTel delivers at half that rate, he believes, it’ll be fast enough for most Vermonters. MyROW’s president and chief technology officer, John Ferry, agrees. As a telecom expert who claims he’s run “tens of thousands of miles of fiber” in his career, Ferry asserts that deploying 4G LTE in sparsely populated regions, especially for “last-mile delivery,” makes a lot of sense, both technologically and economically. 4G wireless has other benefits fiber doesn’t, Ferry adds: It’ll enable Vermont electric utilities to upgrade to smart-grid technologies such as smart metering, which can be read remotely and track individual home and business usage. It’ll also be a boon to Vermont’s mobile capabilities, which are less than optimal in vast parts of the state. In fact, Guité plans to build as many as 10 new cell towers to accomplish his goal. 4G wireless, Ferry concludes, is not the “experimental drug” Nulty makes it out to be — but “the great equalizer” between rural and urban areas. And what does Guité himself say? In person, he vacillates between expressing humility in the face of the task before him, and a stubborn defiance of those who say he’s trying to do what can’t be done. He’s critical of detractors such as Nulty, whom he describes as part of “a class of Mandarin bureaucrats whose job it is to say how bad things are. Connecting the high-speed whozzits with the wireless what-now? While techies guffawed at the late senator’s antiquated analogy, Stevens wasn’t far off the mark. As the Vermont Rural Broadband Project explains on its website, the difference between dial-up and broadband is analogous to the difference between a 3/4-inch water pipe to the home and a 6-inch water main running beneath the street. 4G LTE: Short for fourth-generation, long-term-evolution wireless, it’s the newest and most cutting-edge form of wireless phone and Internet communication. Unlike 1G, which were the old analog cellphones that delivered data at a rate of 12 kilobits per second (Kbps) of data; 2G (500 Kbps); and 3G (1.5 megabits per second), 4G has been tested at speeds of 50 to 60 megabits per second. Critics say it’s never been deployed in the United States and still must obey the laws of physics — e.g., it cannot penetrate mountains, of which Vermont has one or two. Proponents counter that it’s what the world’s largest telecom companies are adopting. Broadband: High-speed Internet access that’s always on, with near-instantaneous access to the World Wide Web, email, instant messaging, video streaming, etc. Compared with dial-up service, which is typically carried over a copper phone line, broadband is faster and much more reliable. The FCC defines broadband as data flowing at a rate of at least 200 kilobits per second. Dial-up: Remember the guttural screeching that once emanated from your hard drive while you waited minutes for your modem to connect? That was dial-up that carried data at 24 to 56 kilobits per second. The reason it sounds like a pterodactyl is that it’s a dinosaur technology that ought to be relegated to history museums. DSL: A digital subscriber line, which uses existing phone lines to carry both telephone and data services. Though it’s 10 to 100 times faster than dial-up, it’s still considered laughably slow by anyone who uses a computer to put food on the table. Fiber: No, not the kind your proctologist recommends. Short for fiber optic, it’s indisputably the most advanced method for transmitting vast amounts of data, including phone, cable TV and Internet service. It works by carrying a series of light pulses over an optical glass strand. More costly to deploy and splice than copper wire, it’s the gold standard for broadband, capable of transmitting data at rates ranging from 1 megabit per second (Mbps) to well over 100 Mbps. Fiber-to-the-home: Just like it sounds, it’s a method of delivering high-speed telephone, cable and Internet service to residences using a single, bidirectional fiber-optic cable. While it provides the fastest and most robust broadband out there, it’s largely impractical in low-density areas where homes and businesses are few and far between. Kilobit: 1000 bits of data. A unit for measuring bandwidth for data transmission. Megabit: See above. This one is 1000 kilobits, or 1 million bits of data. Satellite broadband: A form of high-speed (sort of) Internet access delivered via a satellite connection. Though it’s faster than dial-up and often the only option available in remote locales, satellite broadband has many disadvantages compared with landlines and wireless technologies. They include weather interruptions, “latency” — or the lag time for the signal to travel back and forth to a low-Earth orbit — and physical obstacles, such as trees, clouds and mountains. Wireless: In the telecom world, it’s a method of transmitting data without using wires, often in places where it’s technologically or economically unfeasible to run fiber or phone lines. Typically, signals are broadcast from a transmitter or cell tower fed by fiber-optic lines. Though wireless cannot transmit data at the same speeds as fiber, it has the advantage of being both mobile and cheaper to deploy.